There was a nice Diana's Bow last night, and I took a few pictures. It's interesting to contrast them with some of the shots I got from the lunar eclipse a few weeks ago. 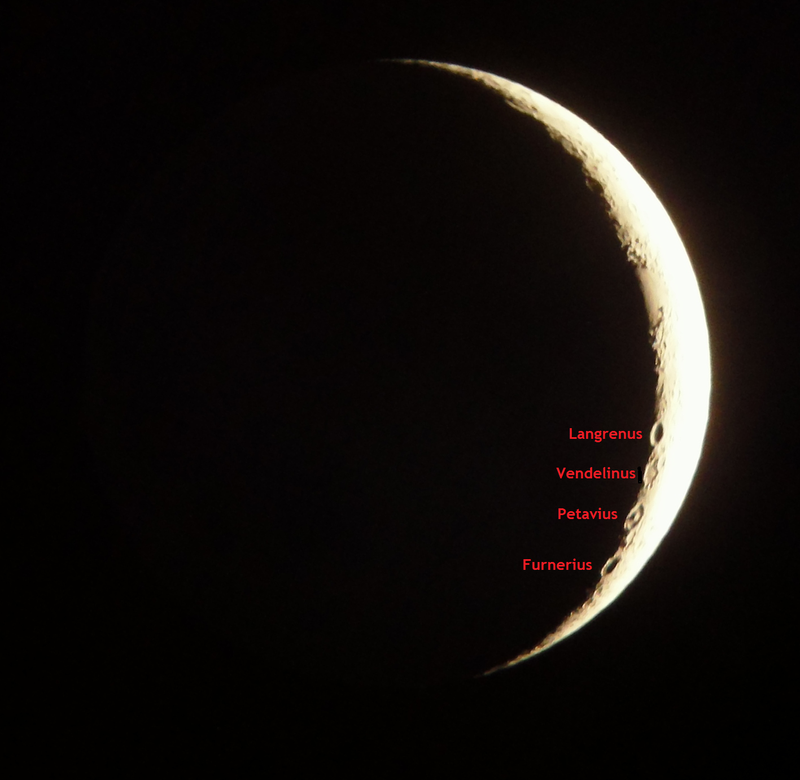 Though the moon is in a position where the sun is only illuminating a very slender crescent, the full disc is visible due to earthshine — light reflected from our own planet. I didn't capture the effect very well here, but it's pretty striking to the naked eye. The moon was still visible during the eclipse despite being fully in the Earth's shadow because we're not nearly big enough to block out all sunlight. The lunar impact crater Petavius is more than a hundred miles across, two miles deep, and they figure it's around 3.8 billion years old. The prominent central peak there is actually a series of peaks, the largest a mile high. Those get formed due to the rebound effect, when there's an impact big enough to cause the rock to act just like you're dropping something in a pool of water. 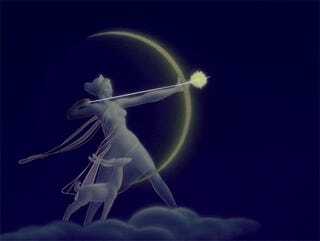 Three nights after the new moon, when the disc is 1/8 illuminated is the traditional time for worshipping the Roman goddess of the hunt, the moon, and archery. The Greeks called her Artemis, and the story goes that she got her silver bow and arrows (her brother Apollo had matching gold ones) from Hephaestus' forge island of Lipara. She went there with her entourage of nymphs and confronted his cyclops master smiths. "And the Nymphai were affrighted when they saw the terrible monsters like unto the crags of Ossa: all had single eyes beneath their brows, like a shield of fourfold hide for size, glaring terribly from under; and when they heard the din of the anvil echoing loudly, and the great blast of the bellows and the heavy groaning of the Kyklopes themselves. For Aitna cried aloud, and Trinakie cried, the seat of the Sikanians, cried too their neighbour Italie, and Kyrnos therewithal uttered a mighty noise, when they lifted their hammers above their shoulders and smote with rhythmic swing the bronze glowing from the furnace or iron, labouring greatly." Artemis wasn't intimidated, and when one of them named Brontes scooped her up and plopped her down on his knee with insulting familiarity, she immediately reached out and tore off a patch of his chest hair so hard that the bald spot never grew back. She got the bow and arrows, promising the smiths a feast of exotic beasts in return.